Roll over the Oscars and the Brits, because the “LiFFA” is set to be the next must-have accolade for all aspiring film-makers. 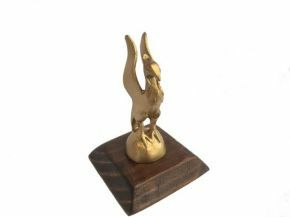 The LiFFA – in the shape of a Liver Bird statue – is the prestigious award to be handed to winners at the Liverpool International Film Festival (LiFF) 2018. The famous “Spirit of Liverpool” Liver Bird design, created by sculptor Rick Myers and former Echo journalist Arthur Johnson, is the inspiration behind the first LiFFA (Liverpool International Film Festival Award). This year is the third time LiFF has been staged and it is being billed as “bigger and better than ever” under the management of Next Chapter Media. Held over two days on November 9th and 10th at the Toxteth TV Studios in Windsor Street, entries for the thirteen award categories are being accepted from around the world. One LiFFA is designated for films made in the Liverpool region, and for the first time ever, LiFF will celebrate not only the best in artistic productions, but also corporate videos and You Tube promotions. Both businesses and individuals are encouraged to submit their entries at: http://www.liverpoolfilmfestival.net. Michael Gordon, the Festival Organiser, said: “We have an expert panel of judges who will review the submissions, with a prestigious gala event at which the LiFFAs will be presented. “We have recognised the surging interest in television and film production in Liverpool itself and one category is reserved for locally-made productions. All winning submissions will be screened in the VideOdyssey cinema room based at the Toxteth TV Studios, part of the facilities operated by Next Chapter Media, including a full film and television studio and production house, as well as the VideOdyssey retro gaming arcade and café. Feature Film, Best Documentary, Short Film, Music Video, Animation, Liverpool Film (shot and edited in Merseyside), and Under-16 film; as well as Best Corporate Video, Best Commercial, Training Video, Best Social Media short, Public Awareness Campaign Video, and Best Corporate film made in Merseyside. There is also a Best of Festival award, made by the LIFF judges panel, for the overall outstanding contribution to film and television. Submissions are open with the final submission deadline set for October 19th, with the Festival occurring on November 9th and 10th this year. Tickets are on sale for the cinema screenings, with single night and festival passes available to purchase through the website. http://www.liverpoolfilmfestival.net.